Our pre-Christmas wanderings this year took us around the vineyards to taste some of the wonderful wines this region has to offer, but this is about food, not wine! The opening of Ben Ean at the old Lindeman’s site brings with it Baume at Ben Ean; a great place to pop into for lunch whilst touring the vineyards. We enjoyed a range of delicious starters including stuffed zucchini flowers, prawn saganaki (beautiful, fresh – and big, prawns! ), mushroom arancini, and black fig and prosciutto salad. 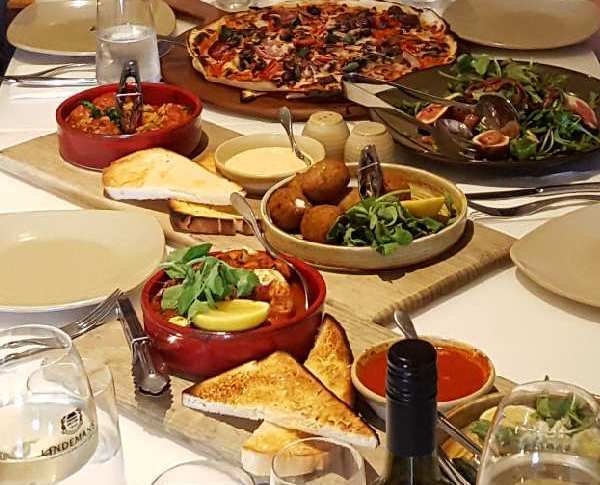 All dishes were quite delicious but we had just enough room for one of their woodfired pizzas, with a light crisp base and traditional style toppings – YUM! Wine is of your choosing from the adjacent cellar door at cellar door prices and the restaurant service, friendly and efficient. All in all, we’d have to say Baume at Ben Ean ticks all the boxes for a lunchtime venue and being open 7 days for lunch, it’s perfect for a midweek visit too.